3 Quick, Easy, Pretty Hairstyles For The Lazy Girl! Difficulty Level: Easier than icing a cake with frosting! Watch the video NOW! Step 1 - Start by brushing your hair to remove all the tangles. Step 2 - Then, divide you hair equally into 2 sections. Step 3 - Once that’s done, make a regular three strand braid from the right section. Step 4 - Continue braiding till the bottom and secure it with a hair tie. Step 5 - Make an opening through the braid (right at the top of it) and pull all the remaining hair (your left section) through it. Also watch: How To Make Pretty Braids Like Alia Bhatt’s – At Home! Step 1 - Start by making a regular three strand braid from the top left section. Step 2 - Continue braiding till the middle of your strands. Step 3 - Pull the loops a little to make the braid look full. Now pin the braid on the other side on the other side of your head. Step 4 - Taking the front left section of your hair, make another 3 strand braid. Step 5 - Again pull the loops to make it look fuller. Then pin it next to the first braid, and you’re done! Also watch: Braids So Pretty (And Easy!) That You’ll Want To Try Them NOW! Step 1 - Start by making a half ponytail. Step 2 - Divide the remaining hair in 2 sections. Step 3 - Make an opening through the ponytail and put the right section through it. Step 4 - Now, take a section of your hair from the previous ponytail and secure it together with a hair tie. 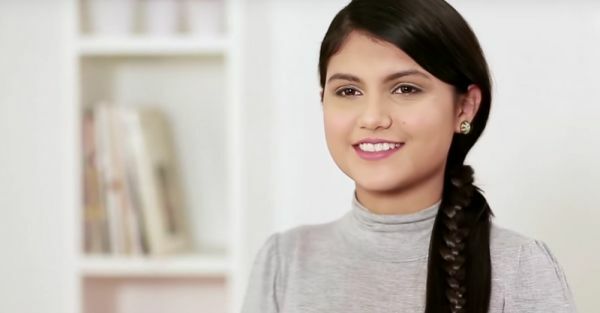 Step 5 - Repeat the same with the left section of your hair Also watch: 3 FAB Hairstyles To Try When Your Hair Feels Oily!